When I married my on-and-off girlfriend in 1980, more than a decade after I’d proposed, I felt my dreams had finally come true. Well, most of them: I wanted children and she did not. But if the choice was between having her and no kids or having the possibility of kids but not her, the decision, I thought, was easy. Our long road to the altar had begun when she was 19, I was 20, and we were both insecure and innocent. We stayed up talking till dawn on the night we met and by morning, a relationship was in the works. She ditched a boyfriend for me; and while I didn’t have a girlfriend to ditch, I would have done so in a second. With the impulsiveness of youth and without knowing much about her, I asked her to marry me only weeks after we’d met. I had no idea what we’d do for money, much less what marriage would involve, but I felt certain we could figure everything out as we went along. So did she, apparently, as she said yes immediately. At the college we both attended, we signed up for a course called Marriage and the Family. Then we told her parents about our intentions. They were conservative Catholics and I was a long-haired liberal from a Jewish family, so I suspected our announcement might not go over well. I felt relieved when my girlfriend’s mother smiled slightly at the news, but then her husband came home and, when I blurted out our plans, he glared at me and cleared his throat. “I don’t know whether I can do anything legally to stop this,” he said, “but I’m going to look into it.” Then he left the room. Shortly thereafter, my fiancée abruptly stopped visiting and taking my calls. I heard through friends that her parents had pressured her into splitting from me and then that she had a new boyfriend. A decade later, though, she was back, all grown up and ready to commit. Still smitten, I convinced myself that things were different. We started living together and, a few months later, when she mentioned that she’d like to get married sometime, I jumped at the opportunity. At the wedding, I saw her father for the first time since he’d left the room in 1969. The marriage seemed ideal for about four years. We rarely fought, and my wife regularly left love notes around the house for me to discover. Then one day, she said she wanted to get away for a week. A few days later, she said that maybe she should go for two or three weeks. Then she said she didn’t know when she’d be back. A little while after that she said she wanted a divorce. In retrospect, I shouldn’t have been as shocked as I was. After all, this wasn’t the first time she’d walked away. And looking back, I realized our communications had actually been too trouble-free. There was no talking through of problems—just a seemingly perfect marriage that one day wasn’t a marriage at all. If you’d told me I had cancer and six months to live, I couldn’t have felt more devastated. But somehow I managed to get on with my life. I even started dating and had a few relationships, though none that satisfied me. But a few months later, we were spending every available minute together. And after she flew off to Taipei, we began a steady stream of letters and phone calls. The relationship that resumed when she returned was quite different from the one I’d had with my wife. Madeleine told me when she wasn’t happy—boy, did she tell me—but she never walked away. Instead we talked through things. Eventually, we got to the M word and talked through that, too. Whereas I’d married my first wife with zero hesitation, I was loaded with uncertainty this time. Not because I was unsure of my love for Madeleine—on the contrary. But divorce had been the worst experience of my life and I wanted to be sure I wasn’t headed for a rerun. So I deliberated for five full years, until I finally realized that there was no way to guarantee against another divorce. If things didn’t work out, I decided, at least I’d understand why I’d given marriage another shot. So we had a big wedding (see photo), complete with a puppet show that depicted our meeting, our commitment fears and our desire to do what it took to make our relationship last. I was still skeptical but after the puppet show, when someone held up a sign that said, “This way to marital bliss!” I felt hopeful. Three months later, on the first day of our delayed honeymoon, Madeleine found out she was pregnant. Our son arrived the next year and our daughter four years after that. 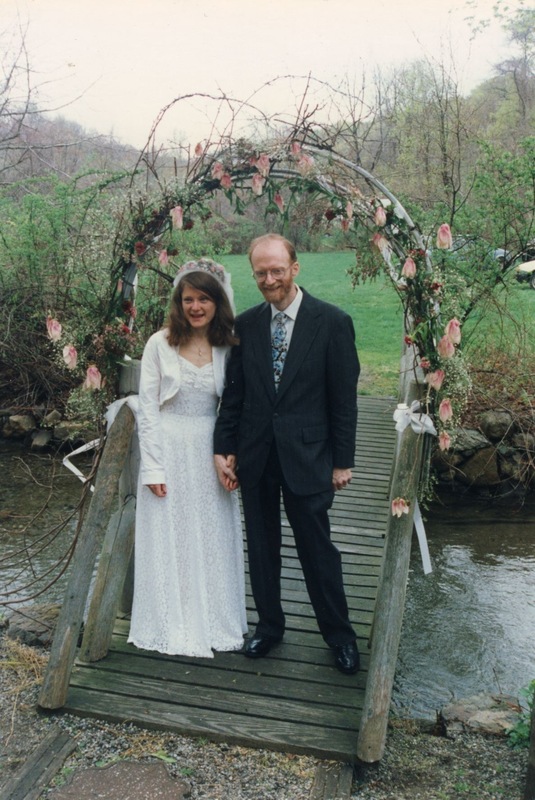 Now the kids I never thought I’d have are blossoming in college and high school and Madeleine and I, who have been together for more than 25 years, recently celebrated a 20th wedding anniversary. I’m starting to think this relationship could last. Interesting story and when you’ve been together for 25 years, yes, a relationship might last! Congratulations on your wedding anniversary.